British Bakelite GPO Telephone Information. Specifically repair, and restoration of antique and vintage GPO Telephones. 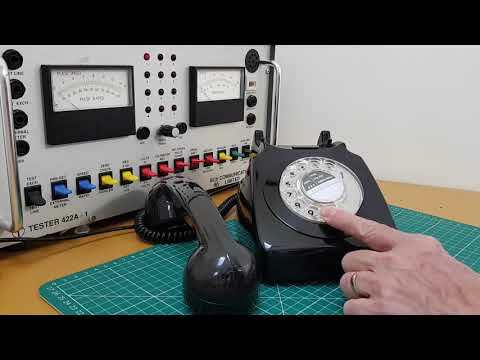 Over the years many people have asked me for a simple explanation of the difference between the old rotary dial "pulse Dialling" and the more modern push button "Tone dialling" telephones. So to make things easier I have produced a simple short (3 minute) video explaining the difference in layman's terms. Please watch the video below. In the late 1930's the 200 series Bakelite telephones were the first British rotary dial telephones to be made out of Bakelite (the original synthetic plastic). Before the 200 series range all old telephones in the UK were predominantly made of metal and wood. At the time Bakelite was a big improvement as unlike metal the Bakelite Telephone bodies were made of electrically non-conductive material, whilst at the same time Bakelite is very resistant to damage by both by heat (unlike modern plastics) and corrosive liquids such as acids. Why do you need a Bellset ! 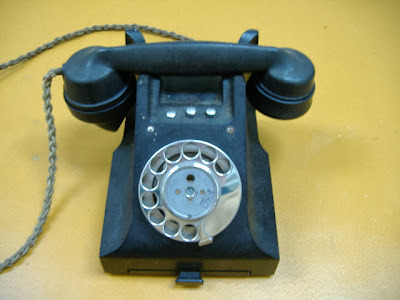 When it was first introduced the 200 series Bakelite phone did not contain an integral telephone bell. 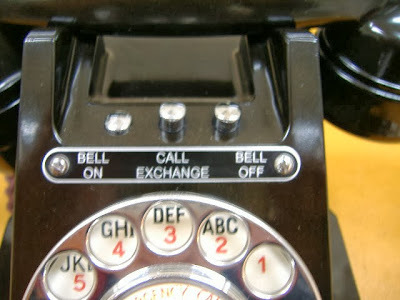 Back in the 1930's it was still thought to be a good idea to have the telephone bell separate to the main telephone body. So basically you had the "Telephone Instrument" as one item and the telephone "Bellset" or "Bell box" as another. This is explained in far more detail in the following video. Using the "right" Bellset ! Today these "Art Deco" early antique telephones are regarded as very collectable. However to achieve the maximum desirability it is VERY important to have them paired with the correct "Bellset" or "Bell box". The Model No 162 Bakelite telephone (the first of the 200 series) should be paired with a (1930's - 1950's) Bakelite Bellset No25 see Information on Bellset no 25 . Alternatively it should be paired with the less common (older, 1920's 1930's) wooden Bellset No1 ,see Information on Bellset No 1. 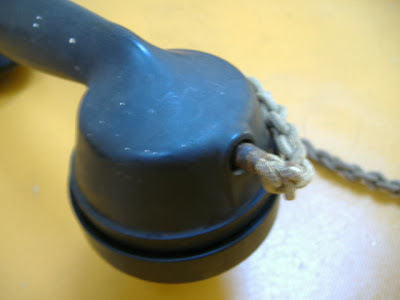 This matching of "Bellsets is particularly important for a No 162 telephone as the components required for "correct speech" were housed inside the Bellset along with the bells not in the main telephone instrument. Without this speech component (induction coil) it is not possible to restore the 162 telephone to is full potential. In simple terms without the correct bellset No25 poor speech quality and potential interference with other telephones or broadband reliability would be a big issue. 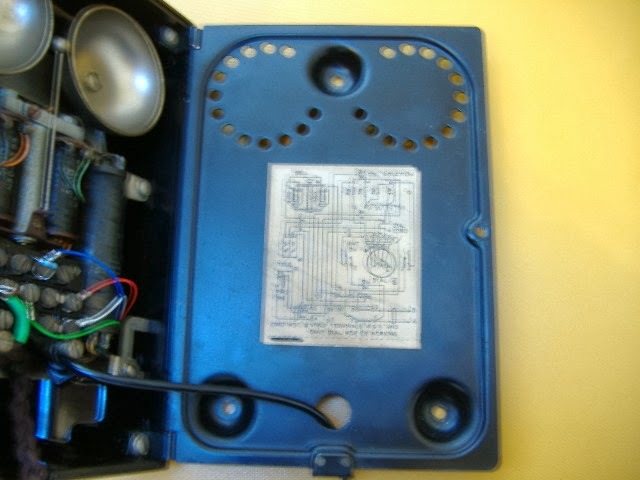 The slightly later (first appeared in 1935) and far more common Model No 232 (200 series telephone) are easier to match up to a bellset correctly as by that point the "telephone instrument" contained all the speech components and the Bellset only housed the bell mechanism. For the avid collector the 232 telephone should be paired with a (1930's - 1950's) Bakelite Bellset 26 or at an absolute pinch the the older Wooden (1920s - 1930's) bell box 1A. They will technically work OK paired with a modern bell mechanism such as the 1960's metal Bellset 64D but that,s not ideal from a collect-ability point of view, as back in the day they would never have been originally paired together. Bakelite Telephones are regarded as Iconic pieces of British History and luckily they can often be restored to 99.9% of their former glory provide the Bakelite is not chipped or cracked. Although Bakelite is a Brittle material, unlike modern plastics it is very resistant to ageing caused by acids pollutants and (UV) sunlight, making it extremely suitable for almost perfect restoration. You just need "lots" of patience and the know how. 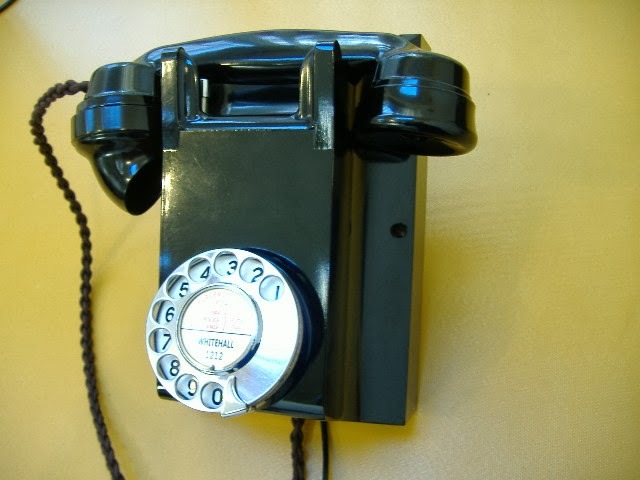 This 60 year old 1953 British Bakelite Telephone (Model Number 314) was restored form its original state, see photograph of this vintage telephone below. Above Fully Restored vintage 314 Phone, Below the same Bakelite GPO Telephone before the restoration process started. 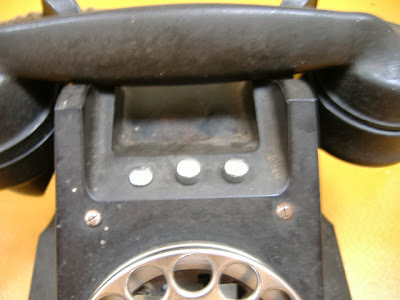 The Bakelite Telephone Restoration process can be broken down into three main areas. 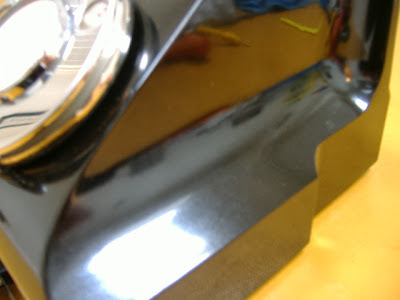 Elbow Grease (Physical Effort), this is 40% of the process. However, if you have access to the correct "slow speed" workbench buffing machine this will help speed up the restoration process and provide a much better final finish. Time and Patience = 50% of the process. 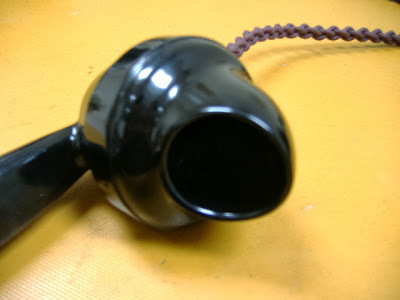 For example the restoration of the Bakelite Telephone above took 9.5 hours of work over a three day time period. 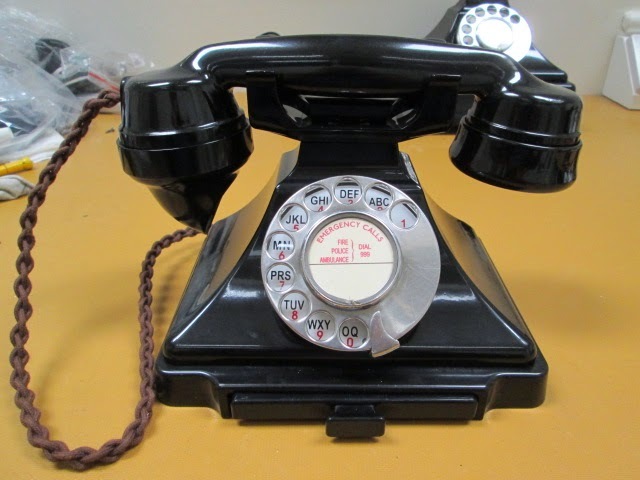 Even with the right tools, experience and compounds you are looking at a minimum of 9 hours to restore a Bakelite phone to this kind of near perfect condition. 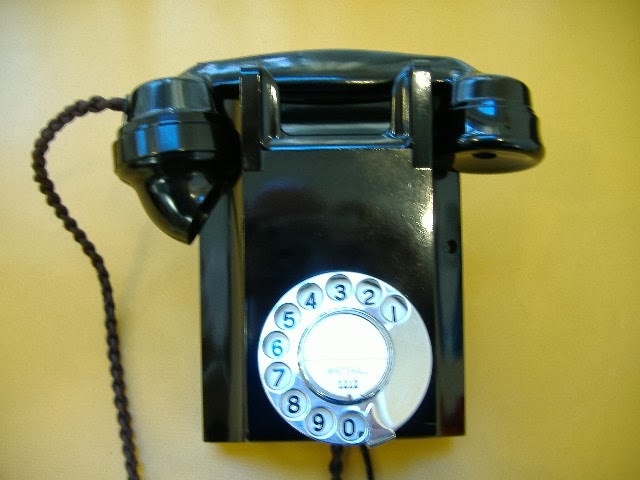 Front View of the vintage Bakelite GPO 314 Telephone, with the rare extra 3 chrome buttons. The Bakelite Telephone Handset, before and after restoration. See how shiny and "near perfect" the right side of this beautiful Vintage GPO Telephone looks after restoration. 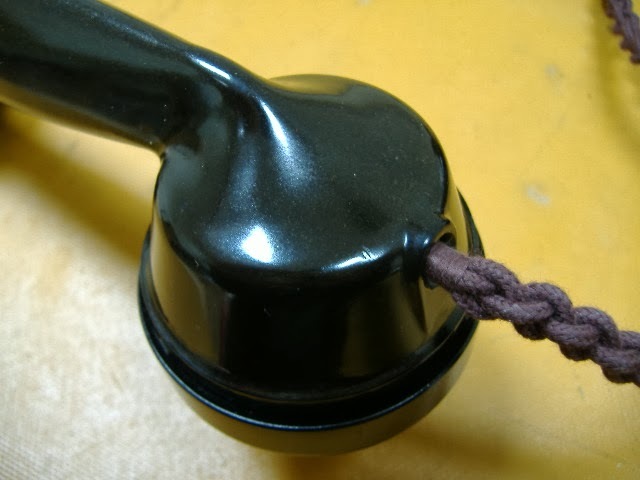 The Classic horn shaped (model no164) Bakelite telephone mouthpiece. Rear view of the vintage telephone. Notice the lovely reflection in the restored Bakelite. High Quality British made cotton Braided Handset Cord. Replacement Dial Number plate (Very high quality, made in the UK). We hope this helps or encourages people to restore these iconic antique/vintage GPO telephones. Remember lots of patience is the key. I would urge you to check with whoever you are buying your telephone from that they are not doing this to the telephones as part of the restoration process. If the speech quality of your 232 telephone is not as good as you think it should be check inside your telephone to make sure you don't have this problem first. This removal of vital components degrades the speech quality of these telephones by approximately 75%. The telephone will still appear to work however the sound quality, usability, and compatibility with the telephone exchange is significantly reduced. It has also been pointed out to me by a colleague that this removal will also cause permanent damage (over time) to the original telephone ear receiver, due to constant DC polarization. 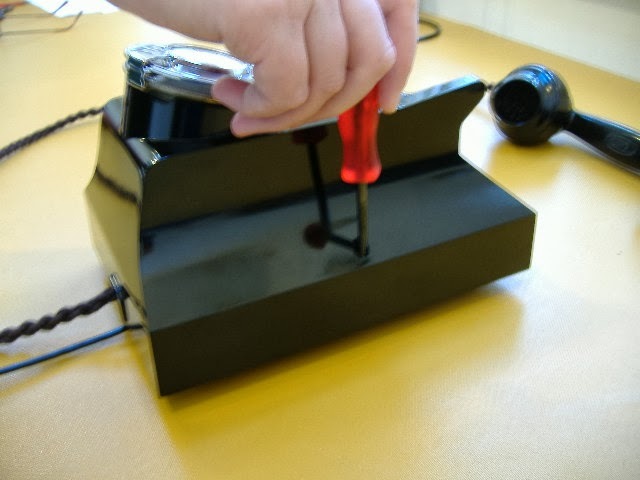 Fitting old British Bakelite wall telephones from the 1940's and 1950's can be tricky if you don't know how. This article has been put together to explain the easiest way to fit these classic N1071 model old telephones. Step 1: Using a flat bladed screwdriver loosen the Bakelite telephone case retaining screw (it only needs loosening not removing). See below. 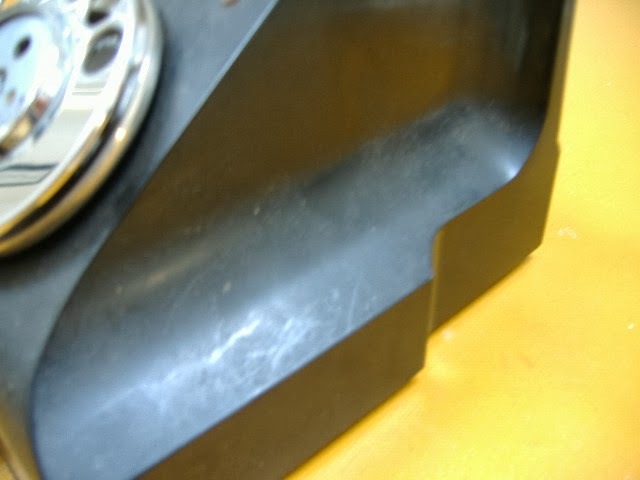 Step 2: The Bakelite case of the telephone should now hinge out from the metal base of the telephone as shown below. This gives easy access to the metal base. The Base (or wall plate) has three mounting points. Step 3: Using a pencil mark the wall through these three holes (one at the top and two at the bottom). Making sure the wall plate is level. Tip: This is a lot easier if you use help, get one person to hold the weight of the Bakelite telephone while you position and mark the holes. Step 4: Drill the marked holes and use the appropriate screws and if needed raw-plugs for the type wall you as fastening it to. 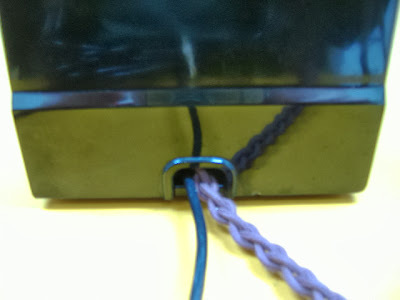 Step 5: Once the wall plate is securely fastened to the wall, you can simply close the case (making sure you do not trap the wires) and gently re-tighten the case retaining screw as in step1. You can now make test calls to your Vintage Telephone and make sure it rings correctly etc. 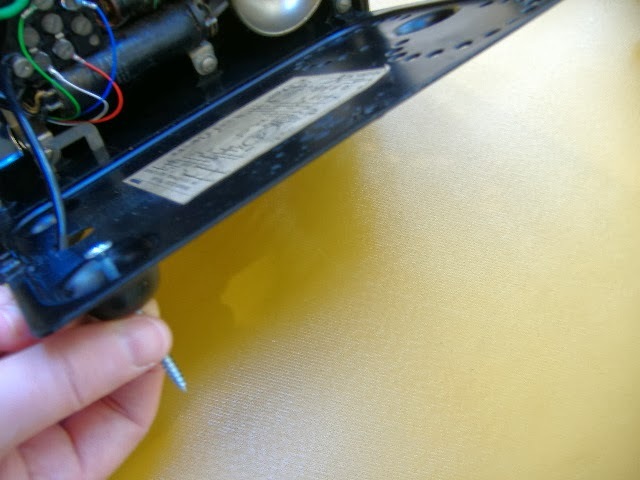 1) The first step is to loosen the retaining screw at the bottom of the Bakelite case (using a flat bladed screwdriver). 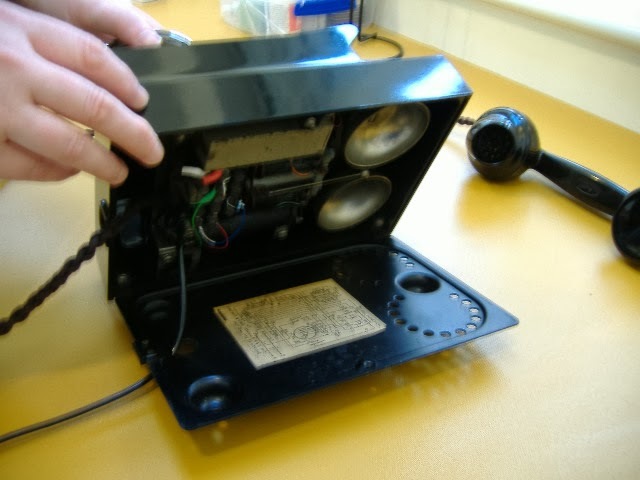 2) Next carefully lift the Bakelite case up off the 321 telephone from the bottom and slide the case gently up as shown below. The case hangs on two metal clips at the top of the bakelite case. 3) Note: The Bakelite case is attached to the telephone body via a strap to prevent it falling to the floor and breaking. Do not remove this strap. 4) You can now position your antique telephone against the wall and fasten it to the wall through the four holes in the telephone case, using the appropriate screws as shown below. Note: Remember to make sure you have a telephone socket within easy reach of the length of the telephone line cord. 6) Although there are four holes in the feet of the telephone (two at the top and two at the bottom) you can sometimes manage with three provided the wall is level. However be very careful, unlike the later 1960's Plastic Retro 746 telephones these antique Bakelite telephones are very brittle and impossible to repair if cracked, so you don't want it dropping off the wall. 7) Once the Bakelite Telephone is securely fitted to the wall you can replace the case on the telephone. 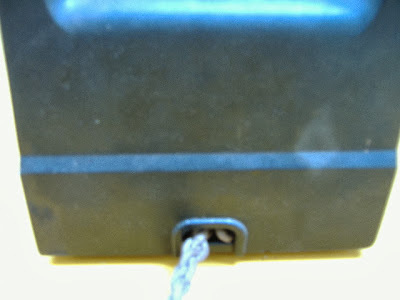 As you can see in the photograph below the bakelite case has two metal clips that fit over the telephone body to "hang" the case on. 8) TIP: Make sure the rubber cable entry grommet for the braided handset cord is located correctly in the Bakelite case as shown below. 9) Finally fasten the retaining screw in the Bakelite base as shown below and plug your line cord into your telephone socket. Most Bakelite Telephone collectors agree that there is no substitute for the Classic British manufactured Bakelite Telephones. When it comes to Antique Telephones British is Best. 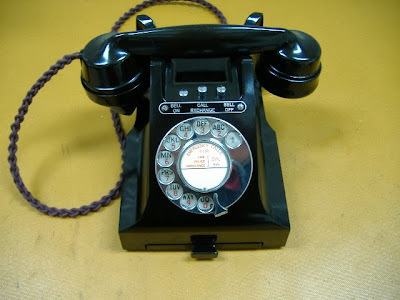 Always look for UK Manufactures whenever buying or selling these Antique/Vintage telephones. If you Look underneath the Bakelite Handset, halfway between the earpiece and the mouthpiece, you should look for the following markings. Again I believe you should look for, and avoid bakelite telephones with the following markings on the underside of the Bakelite Handset. 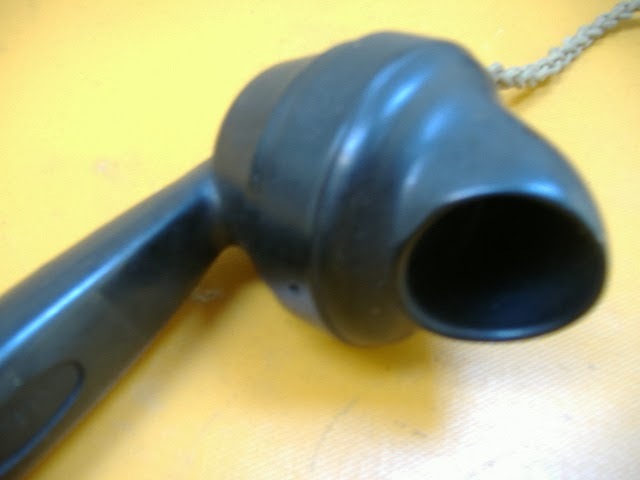 At one end of the scale are the "Genuine Bakelite" telephones made in Indian these are of particularly poor quality when compared to the original British versions. The main reason for this is that ITI (Indian Telephone Industries) made these Bakelite telephones to a cost, out of cheaper materials and to a cheaper design for the local mass market in India. However at the other end of the scale AWA (made in Australia) telephones are of equal quality to there British counterparts, its just that UK collectors are not as keen to obtain them. In the middle the Israel (Telrad) and Portuguese (AEP) telephones are reasonable quality, however the AEP telephones often have slightly different cases and markings making them far less collectable on the British market. As an example for some unknown reason the bakelite handsets on the AEP telephones are not as good as there British counterparts. Bakelite Telephones. Awesome Inc. theme. Powered by Blogger.